If someone anywhere in the world had a stroke or a TIA in the last 60 years, the World Health Organization (WHO) coding system placed the event under either vascular diseases or episodic symptoms, not in the appropriate central nervous system chapter of ICD-10. This situation started with ICD-7 in 1955 and has continued since. It skews all statistics of neurological diseases produced by the WHO. ICD-10 has been in use since 1990, and a total revamp is long overdue. The information is not only stale and old, but incorrect. Codes such as “slow virus infection” for prion diseases are expected to be used in the 21st century? The WHO Department of Mental Health and Substance Abuse, where neurology sits, commissioned a Neurosciences Topic Advisory Group (Neurology TAG) in 2009. I have had the privilege of chairing the TAG, which expanded to involve specialists from all neuroscience specialties. The tasks were huge and detailed. The aim was to produce ICD-11, which will both serve the needs of the non-specialists as well as those working in highly developed institutions. 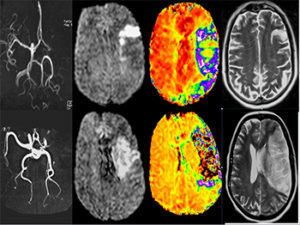 Brain imaging studies capture the evolution of acute ischemic stroke in two patients. Perhaps the most important ICD-10 anomaly the TAG faced was the situation of cerebrovascular diseases (CVDs) and their future placement in ICD-11. Attempting change of the basic architecture of ICD-10 required a major case to be made on the reasoning and practicality of changing an existing status. CVDs fell under Circulation Disorders on the premise that they are a disease of vessels. Statisticians, following the principle of ascribing disorders to their basic etiology, followed this procedure, ignoring the fact that all of the effects of CVDs are neurological and that the initial interaction of the neurovascular bundle is fundamental to the pathophysiology. Moreover, in ICD-10, other ischemic disorders affecting the eyes, bowels, and kidneys fall under the affected organs. Transient ischemic attacks were classified under episodic disorders separate from CVDs. This situation is not only incorrect, but it has led to massive confusion of reporting the fact that a leading cause of death is not placed as a disease of the brain. The first act the TAG performed was to contact and agree with our cardiology colleagues as cardiac events were lumped with CVDs, skewing their statistics as much as ours. They were asked to approve a total separation of cardiac and brain diseases for the benefit of both. This was successfully established with the Cardiology TAG in 2011. It, of course, remains that cardiogenic causes of CVDs are appropriately reported in both sections. The WHO statisticians were informed, and we had “initial acquiescence” until the middle of 2016, when a major statistician’s review of ICD-11 was carried out by the WHO Department of Informatics and Statistics. At that time, statistics advisers had second thoughts, which again placed all CVDs under the circulation section of the Joint Linearization for Mortality and Morbidity section of ICD-11. This decision needed to be reversed, which required intensive lobbying to make the point that stroke is a brain disease. It has to be emphasized that the ICD is “owned” by the WHO statisticians, and our role as clinicians is advisory. Be that as it may, the TAG had to pursue this matter vigorously and provide the scientific reasoning for the change. WFN and the World Stroke Organization (WSO) acted in a closely coordinated manner. Professor Bo Norrving, past president of the WSO, and I, the representatives of the Neurology TAG, used all possible avenues to make the case for the WHO Department of Informatics and Statistics. 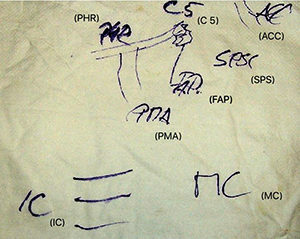 In addition to the production of scientific evidence on the etiology of stroke and the interactions between vessels and brain parenchyma, we needed to mobilize other players to reinforce the message of the importance of stroke being classified as a brain disease for resource allocation and training of staff—medical, nursing, and others—to combat the scourge of CVDs. The issue is vital for the future of neurology, and The Lancet published two letters, one from us1, and the second a reply from the WHO Department of Informatics and Statistics2. We had put forward the argument for stroke moving to the central nervous system, while the ICD classification team put forth its reasoning, quoting continuity and the fact that CVDs were placed in ICD-7 in 1955. This meant going to governments, as they are the ultimate power in the WHO structure. We are most grateful for the support, such as a most powerful letter from Veronica Skvortsova, the minister of Health of the Russian Federation, addressed to the WHO director general. Dr. Skvortsova is herself a neurologist and therefore is fully aware of this anomaly in ICD-10. We also are most indebted to the health ministries of Austria and New Zealand for their support. We were hugely supported by patient organizations that wrote to the WHO and to neurologists from across the world for their support. Following all of this effort, a request came from the ICD classification team asking us to have another face-to-face meeting. This was conducted Dec. 21, 2016, in Geneva. The daylong meeting was most interesting as it started with the assertion of the statisticians on the importance of continuity and stability of statistics over decades. This is something crucial to us all. However, explanations were provided with regard to the need for radical change and why it is crucial to rectify a previous anomaly. The WHO technical department where neurology sits was represented by Dr. Tarun Dua, who made the case for the need to place CVDs under the nervous system diseases chapter of the ICD-11. The Neurology TAG was represented by Dr. Norrving and me. The meeting ended without an immediate outcome. We did not know the meeting’s conclusions for more than three months. The WHO ICD team had to clear its decisions with its statistics consultants from around the world. This is perfectly understandable as many computer systems have to be retuned, and this will need time and finance. Two further medical statistics meetings took place. Finally, on March 31, I was informed by email: “The grouping ‘Cerebrovascular Diseases’ has moved into ‘Diseases of the Nervous System.’” This is a culmination of eight years of work and is the most logical outcome for our endeavors. Now the world of neurology is correctly represented. This is immediately reflected in the soon-to-be-published “Global Burden of Disease” paper, where in 2015 “neurological disorders rank as the leading cause group of DALYs (disability-adjusted life years) and the second-leading cause of death in the world.” This means that resources will be appropriately allocated not only for CVDs but all neurological disorders. The WHO decision was truly momentous, and for that we are grateful. Stroke is back where it belongs. Shakir R, Davis S, Norrving B, Grisold W, Carroll WM, Feigin V, Hachinski V. Revising the ICD: stroke is a brain disease. Lancet 2016; 388:2475-6. Boerma T, Harrison J, Jakob R, Mathers C, Schmider A, Weber S. Revising the ICD: explaining the WHO approach. Lancet 2016; 388: 2476-7. The WFN Nominating Committee announces the candidates for the following positions. The Council of Delegates will vote during the WFN elections at the upcoming World Congress of Neurology in Kyoto, Japan. Recently, there has been an explosion of health awareness recognized by individuals, nations, and the global community. The decade of the brain was followed by the human genome project, accompanied by the near eradication of malaria and polio. Yet, we now stand at the threshold of even more rapid advances on many fronts. 3-D printing of the human heart is being used in planning cardiac surgery. Next-genome sequencing is revolutionizing old concepts of disease. Gene therapy shows success in some inherited neuropathies (spinal muscular atrophy) and myopathies (Duchenne muscular dystrophy). Precision medicine is no longer an aspiration in some diseases and countries, and the ability to use publicly accessible data via expanding cloud technologies is yielding unexpected information and the repurposing of medications. Conversely, the cost of drug development, especially in bringing them to market, is becoming prohibitive, exacerbating the accessibility of therapies in many countries. For the thoughtful and the less fortunate, it is obvious that the developing progress, while exciting and to be celebrated, is creating problems that need to be addressed. The increasing burden of non-communicable diseases (NCD) adds up to what can only be viewed as a potential tsunami for the economies of the world. These NCDs include mental (neurological) and substance-abuse disorders; musculoskeletal disorders; neurodegenerative conditions such as dementia, stroke and Parkinson’s disease; poor lifestyle choices in diet and exercise; and the effects of unhealthy environments1 together with the changing demographic of aging populations in so-called developed countries. Those people and countries least able to afford the advances and/or mobilize services to adjust to them will see a widening gap, not only in these areas of disease but also in their ability to respond to the periodic recrudescence of infectious disease. This was seen with the outbreaks of Ebola, MERS, SARS, and, most recently, the Zika emergency. It is not by chance that the recent waves of mass migration have occurred as much because people seek better lifestyles (and health services) as fleeing armed conflict. It is in this environment that those in the neurological fraternity need to mobilize and prepare measures at a number of levels that will mitigate the consequences of these changes. To begin, we must look at the magnitude of the problems facing us. Then, we will evaluate the resources we have available. Finally, we will view three illustrations of how those resources can be optimized to provide the organizational readiness for rapid and effective action as well as long-term planning on a national, regional, and global scale. The global burden of neurological disease figures as a relatively small fraction of the global burden of all disease (GBD) for a range of reasons2. Although not included in the WHO 2014 global status report on NCDs3, stroke and dementia are of major concern to clinicians and national health systems. The annual stroke toll is approximately 15 million, with one-third being fatal and another third permanently disabling. Indeed, stroke mortality is double that of HIV/AIDS, malaria, and tuberculosis combined, emphasizing the rising burden of brain NCDs. With rates of dementia estimated to triple from 47.5 million to 115 million worldwide by 20504, it is clear that the world faces a rising impost on resources. Currently, the total burden of mental, neurological, and substance abuse (MNS) is now reckoned to be 258 million disability-adjusted life years — a measure of overall disease burden expressed as the number of years lost due to ill health, disability, or early death. That is up from 182 million in 1990, which has been equated to a $8.5 trillion (U.S.) loss of economic value now, and which will increase again by a factor of two by 20305. With the addition of other NCDs to stroke and dementia, it is clear that the world neurological fraternity must act in concert and alert governments. Those other NCDs include age-related Parkinson’s disease and other chronic neurodegenerative disease, perinatal injury largely due to asphyxia, childhood developmental and degenerative disease, schizophrenia, high levels of traumatic brain disease, all causes of epilepsy, substance and alcohol abuse, and rising neuroinflammatory disease of the brain and spinal cord. While world neurological expertise has been steadily advancing partly in parallel with the recognition of the increasing challenges on the horizon and partly with the advances in medical science, it is far from equitably distributed. When the widening gap between well-developed countries with comprehensive health care and those less developed populations and health care systems is appreciated, the likelihood for an emergency is evident6. There are a number of valuable resources available. These include measures of the GBD and specific problem areas, such as the NCDs, BNCDs, and MNSs, as well as WHO monitoring for more acute challenges to health through national health departments and WHO’s regional structural organization. (The WHO regional organization mirrors approximately that of the WFN). The periodic assessments of the GBD by the WHO and the Atlas of Neurology (a joint WHO-WFN project) provide the broad sweep, big picture view of resources and needs. The WFN itself plays an important and growing role in the equalization of access to neurological care both through regional organization support and neurological education. 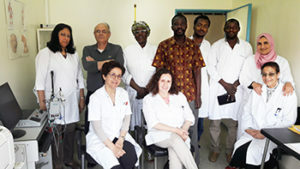 The establishment of the African Academy of Neurology (AFAN) and its first meeting in Tunis this year are illustrative. 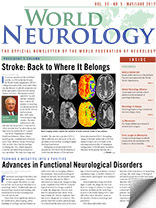 It joins the expanding roles of other WFN regional organizations, including the Pan American Federation of Neurological Societies (PAFNS), the Australasian and Oceanian Association of Neurology (AOAN), the Pan Arab Union of Neurological Societies (PAUNS), the American Academy of Neurology (AAN), and the European Academy of Neurology (EAN). Neurological training, the improvement in access to neurological care, and an increasing awareness of the importance of brain health in the general population are furthered by World Brain Day (WBD)7 and the biennial World Congress of Neurology (WCN). The WFN, in partnership with AFAN, has followed the World Federation of Neurosurgical Societies (WFNS) program to train young African specialists. The WFN plans to have four regional training centers in Africa — two each for the Francophone and Anglophone regions. Additional emphasis of WFN involvement at a global level was given by WFN President Raad Shakir as chair of the Neurosciences Topic Advisory Group for the WHO-sponsored International Classification of Disease (ICD-11), due for release in 2018. More generally, other areas are developing, which will enhance the ability to respond to challenges. Increasingly rapid communication through electronic media, including social media, draws attention to emerging problems. The maturation and expanding expertise of neurological subspecialties and their involvement in wider educational activities (e.g. the International League Against Epilepsy, the World Stroke Organization, and the Movement Disorders Society) as well as the added interest of the larger regional neurological organizations, such as the AAN and EAN, provide a rich resource of intellectual and monetary capital. Over the last few years, the WFN has provided a focal point for those involved in the medical care of neurological disease through two similar, though importantly different, groups. The first is the World Brain Alliance (WBA). Originally chaired by Vladimir Hachinski, MD, when he was WFN president, it is now chaired by Dr. Shakir. The WBA members include, in addition to the WFN, global organizations that usually do not include neurologists, such as the WFNS, the International Brain Research Organization (IBRO), the World Psychiatric Association (WPA), the International Child Neurology Association (ICNA), and the World Federation of Neurorehabilitation (WFNR). The second group is the Global Neurology Network (GNN) for which the WFN is the current convener and whose members mainly include neurological disease-specific organizations from around the world. Many were originally part of the WFN but have grown to be independent organizations. They include the World Stroke Organization (WSO), the International League Against Epilepsy (ILAE), the Multiple Sclerosis International Federation (MSIF), the Treatment and Research in Multiple Sclerosis (TRIMS) Group, Alzheimer’s Disease International, the Movement Disorder Society, the International Headache Society, the International Society for Clinical Neurophysiology, the Peripheral Nerve Society, and the Tropical Disease Group. Closely associated with this category of disease-specific organizations are both large regional organizations supporting all neurological subspecialties, such as the AAN and the EAN, and the smaller WFN-affiliated regional organizations, such as the AOAN, PAUNS, PAFNS, and AFAN. Together, these two groups create an impressive global alliance of neurological expertise. It is an alliance appropriately suited to provide global disease-specific advice to international organizations, such as the WHO and the U.N., and to advocate with these organizations and national governments. It is an alliance worthy of the term Global Neurology Alliance. The most critical function of a global alliance of neurological organizations is the ability to formulate, organize, and execute rapid and effective policy or reaction. A powerful advocacy initiative that can mobilize governments and NGOs is of enormous value to those under threat, and it is the rapidity of communication and the common understanding of the advocating group that empower these initiatives as a force for good. Underlying this ability are two fundamentals. The first is an intimate understanding by the subspecialty organization in the national, regional, and global spheres of all matters affecting practitioners and patients. The second is the intercommunication among the various subspecialty organizations facilitated by the GNN. Regular meetings, updates on activities, and a common understanding of the means to reach their constituencies contribute to the effectiveness of the network. Recent examples of where this alliance has been called to mobilize and has proven its worth are the 2015 Zika virus outbreak, the WHO initiative on NCDs, and the crisis over the WHO classification of stroke as a circulatory rather than neurological disease. The outbreak of the arthropod-borne (Aedes aegypti) Flavivirus crisis, known as Zika virus, in April 2015 in Brazil, was designated by the WHO in February 2016 as a public health emergency of international concern (PHEIC)8. Zika was first found in Uganda in 1947, and the first outbreak of disease occurred in Micronesia in 2007. The South American outbreak was much worse. The primary infection was often asymptomatic or relatively banal, comprising arthromyalgia, a light rash, or a low-grade fever. The major secondary effects were of brain neuronal migration injuries to the fetuses of pregnant women manifesting often, but not solely, as microcephaly, and a postinfectious neuropathy resembling Guillain-Barré syndrome. Given the unknowns with this outbreak and the urgency to gather information, a committee, headed by John England, MD, was constituted, assisting the global investigation of the outbreak. The committee was supported by WFN resources through the regional organization in South America, the expertise within the organization, and the rapidity with which the WFN could respond to assist. PHEIC status was ceased in November 2016. The NCD initiative, launched in 2011 by the WHO following the GBD report highlighting the impact of NCDs9, concentrated on cardiovascular disease, cancer, diabetes, and respiratory disease. Omitted were major illnesses central to brain health, such as dementia and stroke. The omission was questioned by the global neurological fraternity. The WFN, through its role as WBA convener and led by Dr. Shakir, waged a campaign to have brain NCDs included in the initiative5. How did such a situation arise? It seems that because the WHO viewed stroke and dementia not to be brain diseases but rather as circulatory and mental disorders, respectively, they were not included as risks to brain health. There are historical reasons for this view, which were defended by the WHO, but ICD-11 brought this matter to a head. In doing so, it also provides an illustration of the value of a global neurological alliance. The ICD is revised every decade. ICD-10 was adopted in 1990, and in 2007 the revision ICD-11 was commenced under the supervision of the Revision Steering Group, which took advice from a number of Topic Advisory Groups (TAGs). The ICD-11 Neurology TAG was constituted in 2011 under the leadership of Dr. Shakir. Soon after this process commenced, stroke was apparently accepted as a disease of the brain. When the beta version of ICD-11 was published in 2016, the neurological and stroke fraternities were astounded to find that stroke had been changed to a circulatory disease. Clarity as to the reason stroke had been omitted from the NCD initiative had arrived. Stroke was not a brain disease. The decision galvanized the neurological and stroke communities. After considerable effort, it was determined that the powerful statistics group within the WHO had been at the forefront of the opposition to the change initiated by the Neurology TAG. While the grounds for such opposition were reasonable and based on a desire to obtain the best longitudinal epidemiological data, it effectively “hid” the impact of stroke in the global community and paid little heed to the growing evidence of the contribution of cerebrovascular disease to dementia and NCDs in general. It is no accident that these external initiatives of the WFN and partners have been successful. The ability to respond rapidly, to gather expertise, and to plan and implement the agreed approach, while maintaining the flexibility to adapt to developments, are the prime reasons. That there has been an immediate sense of shared purpose, and the acknowledgement that together we are better able to present the arguments firmly and authoritatively, has no doubt assisted. The foresight of the originators of these two groups has to be praised, as does the leadership of the current WFN president and the members of the WBA and GNN. W. (Bill) M. Carroll, MB, BS, MD, FRACP, FRCP(E), is first vice president of the WFN and is the WFN convener for the Global Neurology Network. Vos T et al Years lived with disability (YLDs) for 1160 sequelae of 289 diseases and injuries 1990–2010: a systematic analysis for the Global Burden of Disease Study 2010. Lancet. 2012;380:2163–96. Global, regional, and national incidence, prevalence, and years lived with disability for 301 acute and chronic diseases and injuries in 188 countries, 1990-2013: a systematic analysis for the Global Burden of Disease Study 2013. Lancet. 2015; 386: 743–800. Global Status Report on Noncommunicable Diseases 2014. WHO ISBN 978 92 4 156485 4. Prince M et al. The global prevalence of dementia: a systematic review and meta-analysis. Alzheimer’s and Dementia. 2013; 9: 65-75. Shakir R Brain health: widening the scope of NCDs. Lancet 2016,387: 518-519). Income inequality: The gap between rich and poor. OECD insights 2015. Wasay M et al. World Brain Day 2016 celebrating brain health in an ageing population. Lancet neurology 2016;15:1008. Zika virus and complications: 2016 Public Health Emergency of International Concern. WHO Int on line. Bloom D E et al. 2011 The global economic burden of non-communicable diseases. Geneva: World Economic Forum. Shakir R et al. Revising the ICD: stroke is a brain disease. Lancet 2016, 388: 2475-2476. This year’s World Brain Day commemorates the foundation of the WFN. The prior World Brain Day topics were aimed at epilepsy and dementia, and now it is aimed at stroke. We are partnering this time with the World Stroke Organization (WSO), which puts great global effort into the prevention and treatment of stroke. The topics of this World Brain Day should be the awareness of stroke, the symptoms, the prevention, and the new evidence for optimized treatment. Neurorehabilitation is increasingly becoming important. World Brain Day is supported by the Public Awareness committee jointly with the WSO to make this day a success. As in the previous World Brain Days, a special logo will be produced, as well as material for local use, which can be used with the regional societies. Prior to World Brain Day, a template for press mailings will be distributed to help the local organizations. Closer to World Brain Day, a webinar will be accessible and, with invited participants from the press, will spread the news. Despite these activities and help, the success of World Brain Day depends on your local activities. Please make the World Brain Day your own, use all of the material we provide, and ask for more if needed. Experience has shown that this international day has created much press attention, but local activities and information make the difference. Please involve patients, caregivers, the public, and interested patient groups who will be interested in this topic. Stroke care faces many global inequalities, in regard to infrastructure, care, and support! Needless to say, we are eagerly awaiting your reports of your local events, so we can publish them in World Neurology. Also, please post your activities on social media. 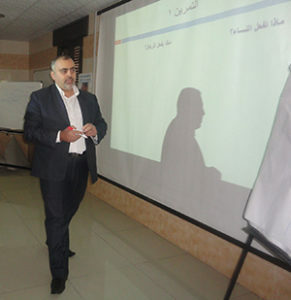 A workshop about epilepsy was presented during a training course funded by the World Health Organization. Aleppo, Syria, was subjected to a comprehensive war that directly affected all of its humanitarian services. Before July 2012, the difficulties were limited, with most related to security and transport problems. However, by the end of July, the city had been torn into two large sections. With daily bombardments and clashes, the city’s population plummeted from 4.5 million to 1.5 million. Coinciding with this, the city experienced a complete absence of electricity, a severe decline in health services, and an insufficient number of beds available for hospitalization of stroke patients in government hospitals. The quality of service provided by the private sector decreased. No MRI device was in service, either in the governmental or private sectors. Seventy percent of the CT machines no longer worked. A number of neurologists (about 12 out of 30 doctors) left because of the security chaos. There were no neurologists in the area controlled by the armed people. Patients had to travel for several days to see a neurologist. This was accompanied by the interruption of the supply of most neurological drugs from local markets, especially antiepileptics (valproate, carbamazepine, and phenytoin) and all antiparkinson drugs. 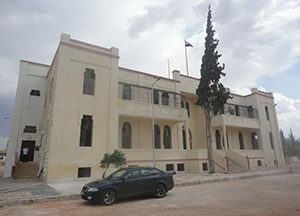 A hospital with 40 beds, built in 1943 and rehabilitated in 2014, has a physiotherapy and rehabilitation department with an EEG machine. In addition to the unavailability of the necessary anticoagulants for stroke, one of the most important challenges was the loss of records for the treatment of multiple sclerosis (MS). About 900 patients had been periodically reviewed for free medical service and treatment (interferon beta of all kinds). Patients were dispersed, some migrated, and others had new attacks without finding the right medication (methylprednisolone) or the correct diagnosis. All physiotherapy services disappeared. Although there were a number of therapists, the work was futile. Due to the many injuries associated with shrapnel and peripheral nerve trauma, neurophysiologists for electromyogram and nerve conduction velocity tests were needed. There also was the occurrence of a number of cases of flaccid paralysis, and it was difficult to find treatment. In January 2013, life was unbearable, and the city seemed to be gloomy without electricity or water, along with the decline of all basic services. By 2014, a road to the city opened, bringing supplies to the besieged population. Small, private generators within neighborhoods delivered a limited supply of electricity. An MS committee was reorganized, and up to 365 patients were treated for free with beta interferon, but the drugs were from generic companies. With the passing of time, the service situation stabilized, and the security improved. The U.N.’s international organizations reached the city and helped improve the health system. Since mid-2014, medicine has become available in an acceptable, but insufficient manner. Currently, most essential neurological drugs are available. The most important are antiepileptic drugs (carbamazepine, sodium valproate, lamotrigine, levetiracetam, and clonazepam), but the supply is unstable. There are still difficulties in securing antiparkinson drugs, especially levodopa. Continuing medical education and training have declined. The health sector has not prioritized the provision of services. However, there have been improvements since 2015. The road from Aleppo to Damascus has become safer. Scientific activity has slowly returned, but fear still prevails over some doctors. Some of the government hospitals are open, including a free neurology clinic at Ibn Khaldoun Hospital. There is free EEG service at three locations, and rehabilitation at one of the public hospitals is open to neurologic patients. Dr. Mohammad Bassam Hayek is a neurologist in Aleppo, Syria. He is vice president of the Syrian Society of Neurosciences and general director of Ibn Khaldoun Hospital. University Professor Dr. Hanno Millesi, a doyen of modern nerve surgery, died April 28, 2017, in Vienna, Austria. He was 90. Dr. Millesi was born in Austria in 1927. He finished his medical studies in Innsbruck in 1951, and started his career in surgery at the University of Vienna. He was one of the founders of plastic and reconstructive surgery in Austria, and chaired the department at the University of Vienna until his retirement in 1995. He has a long list of international achievements, including being a member of the Sunderland Society, the International Society for Reconstructive Microsurgery, and the World Society for Reconstructive Microsurgery. He has a long list of publications and books, and was actively involved in peripheral nerve research until his death. Dr. Millesi had an eminent interest in surgery of the peripheral nerves, and was one of the pioneers in using autologous nerve transplant, which revolutionized the concept of nerve repair. He also developed the methodology of microsurgical neurolysis, which aims to decompress nerve fascicles. He remained active in the field of research until his death. In his last years, he was devoted to tissue and environment of peripheral nerves, in particular nerve gliding. Increasingly, he incorporated the new imaging methods, in particular high-resolution ultrasound, in his concepts. Dr. Millesi was a dedicated physician, and was appreciated for his lexical knowledge and his ability to consult and advise. He was tireless with regard to patient issues and any aspects of peripheral nerve. Dr. Millesi was not only an excellent surgeon and scientist, but he also was a good example of collaboration between the fields of neurology and plastic and reconstructive surgery. His concepts of nerve surgery, re-innervation, and applied neuroplasticity taught neurology a lot. These concepts have advanced the knowledge of nerve repair and reconstruction from a static approach to a highly dynamic field. Robert Schmidhammer, MD, is a university professor at Millesi Center in Vienna. Wolfgang Grisold, MD, is WFN secretary general and a professor at Ludwig Boltzmann Institute for Experimental and Clinical Traumatology in Vienna. Participants at the third regional WFN NSRG meeting. (From left) Aleksandr Dzhanashvili, MD, PhD; Eva Bartels, MD, PhD; Ekaterina Titianova, MD, PhD, DSc; Natan Bornstein, MD, PhD; Alexander Razumovsky, PhD, FAHA; and Marina Alpaidze, MD. The WFN Neurosonology Research Group (NSRG) is dedicated to the promotion of science and research as well as education and training in the field of ultrasonic techniques (carotid duplex and transcranial Doppler) and their clinical utilization. Therefore, international cooperation and the dissemination of scientific information within the field of neurosciences and neurosonology is part of the WFN NSRG activities. On Oct. 22, 2016, the Georgian Chapter of the WFN NSRG successfully conducted its third regional meeting in Tbilisi, Georgia. 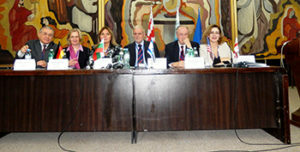 The meeting included participants from the neighboring country of Azerbaijan. The one-day course was designed for individuals who are interested in performing and interpreting neurosonology studies. This third Georgian meeting was guided and directed under the auspices of the NSRG of the WFN and accredited by the Tbilisi Medical University Continuing Medical Education (CME) Board for 10 CME hours. 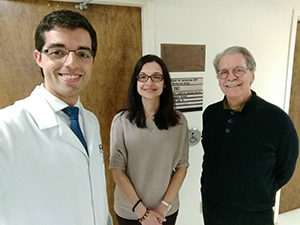 Giordani Rodrigues dos Passos, observer (left), Mrs. Vanessa Spyropoulos, clinical nurse specialist in the MS program, and Dr. Yves Lapierre, director of the MNH Multiple Sclerosis Clinic. One month after completing my neurology residency in Brazil, I had the opportunity in March to participate in the Canadian Department Visit Program, during which I served as an observer at the Montreal Neurological Institute (MNI). The administrative staffs of the WFN and the MNI were excellent, both before and during my stay in Montreal. My schedule was arranged by Dr. Anne-Louise Lafontaine, who made sure to take my main interests into account. My main interest is MS, which is roughly 10 times more prevalent in Canada than it is in Brazil. From a clinical perspective, this observership was remarkable because I saw several dozen MS patients, covering a wide range of clinical aspects and treatment strategies. 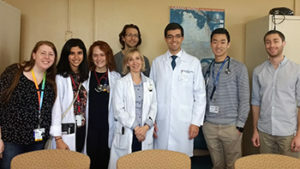 Dr. Anne-Louise Lafontaine (center), chief of the Department of Neurology of the McGill University Health Center, and Giordani Rodrigues dos Passos (third from the right), observer, with neurology residents and medical students during rounds at the Montreal General Hospital. Health care and research are closely integrated with mutual benefits. The MNI is remarkably able to communicate its actions and achievements to the scientific community as well as the patients and society as a whole. This increases its ability to raise additional funds for research. Multidisciplinary teams at the clinics and in the wards improve significantly both the neurologists’ work and patient outcomes. Canadian neurology residents receive more in-depth training on neuroanatomy, pathophysiology, and semiology than most of their Brazilian counterparts. Many of these elements could be implemented in my workplace, an 800-bed university hospital in southern Brazil. What I learned at the MNI will improve my practice as a neurologist and researcher in the coming years. It also will serve as a lesson when I have opportunities to participate in my hospital’s institutional decisions. 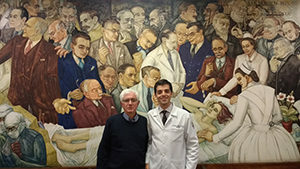 Dr. Jack Antel (left), professor at McGill University and president of the Americas Committee for Treatment and Research in Multiple Sclerosis, and Giordani Rodrigues dos Passos, observer, at the Montreal Neurological Hospital. A minor drawback of my observership was the March break, which took place during my first couple of weeks there. During this time, some of the clinic’s work was suspended, and some of the attending neurologists were away from the hospital. Even though I was able to find alternative clinical or academic activities to fill my schedule, I suggest the next observers be advised of the March break and encouraged to choose another month for their MNI visit. Giordani Rodrigues dos Passos, MD, works in the Department of Neurology at São Lucas Hospital in Porto Alegre, Brazil.